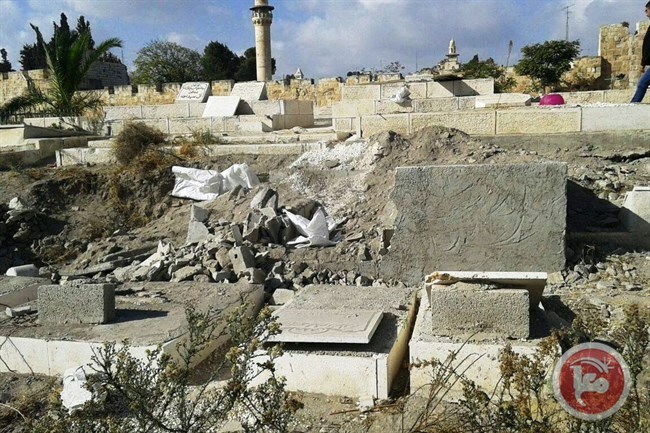 JERUSALEM (Ma’an) — Israeli Nature and Parks Authority forces demolished several graves inside a Palestinian cemetery in occupied East Jerusalem on Tuesday morning, according to local sources. Sheikh Omar al-Kiswani, the director of the Al-Aqsa Mosque compound, told Ma’an that forces from the Nature and Parks Authority raided the Bab al-Rahma cemetery — which runs along the eastern wall of Jerusalem’s Old City — and demolished six Palestinian graves and crumbling tombstones. According to al-Kiswani, the authorities claimed the graves and gravestones were constructed on “confiscated land” belonging to the Israeli Nature and Parks Authority. Al-Kiswani countered the claim, citing official documents that state the graves that were demolished were owned by the al-Husseini and al-Ansari families. An Israeli Nature and Parks Authority spokesperson was not immediately available for comment. This video filmed by locals shows the aftermath of the demolitions at the cemetery. Al-Kiswani highlighted past efforts of Israel’s Nature and Parks Authority to confiscate parts of the cemetery’s land, and to prohibit Palestinians from digging grave plots in the so-called “confiscated zones,” as part of a larger aim to turn the area into a tourism park surrounding the Old City. Mahmoud al-Habbash, a Palestinian Authority (PA) adviser on religious and Islamic affairs, condemned Tuesday’s grave demolitions in a statement. Al-Habbash added that the demolitions were “a crime that Israel must be punished for, in accordance with international law.” He stressed the sanctity of the the Bab al-Rahma cemetery, as it is considered an Islamic heritage site and part of the Al-Aqsa compound.